If you could talk to an extraterrestrial civilization, what would you say? That’s the question being asked, in all seriousness, by a group of scientists and science enthusiasts at the University of Toronto. As part of the newly organized Toronto Science Festival (TSF) they are asking the general public to submit potential messages by e-mail, Twitter, or online video. 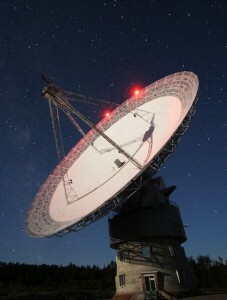 Suggestions are already trickling in, and within a few weeks the winner will be chosen and actually broadcast into space by the Algonquin Radio Observatory, a 46-metre-wide dish perched on a lonely outcrop of the Canadian Shield in Ontario’s Algonquin Provincial Park. A publicity stunt, you say? Perhaps, but it’s also a rare chance to re-connect with an important piece of Canada’s scientific heritage, and an opportunity to do some of the Big Thinking that is always needed to drive scientific inquiry forward.